THE RUPTURE SERIES PRESENTS: CALCULATED Katie Hare, after Heavens To Betsy THE OLD POLICE STATION 114 Amersham Vale, London, SE14 6LG 14th - 16th October 2011 Friday: 18.00  21.00 Saturday  Sunday: 12.00  18.00 The Rupture Series and artist Katie Hare are proud to present âCalculated,' a sound and video installation as homage to riot grrrl band Heavens to Betsy's first and only album. Over three days, Calculated will play in the cells at The Old Police Station alongside archive footage of the band and an accompanying zine, containing personal writings by the artist, curators and selected contributors. 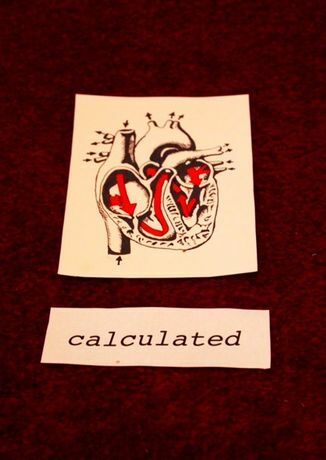 âCalculated' will be exhibited as an historical artefact and snapshot of the precise moment that an individual's belief system is shattered; a young person becoming politicised through punk music and confronting their position in society. The viewer/subject is invited to take a step back and focus on the spectacle of the searing honesty of the lyrics, and the intensity of youthful conviction and coming of age whilst in the confinement of a single police cell. The art work is an affectionate tribute to âriot-grrrl', the fascinating youth movement that is in equal parts revered and reviled. Katie Hare (b.1987) graduated from her BA in Fine Art at Central St Martins School of Art and Design in 2010 and has since exhibited in London, Manchester, Berlin and Whitstable as part of the Whitstable Satellite exhibition. Hare's work explores the coming of age of young women in relation to domestic space and popular culture. 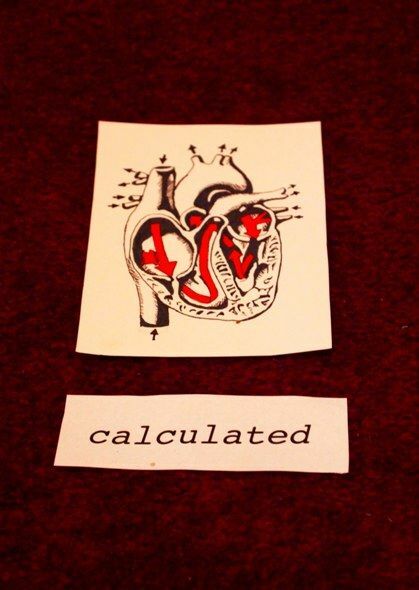 Calculated is the second event of The Rupture Series, a programme of events and exhibitions taking place at selected venues over 2011  2012. The programme is an investigation of how art may appear to rupture a space possessed by a specific ideology. For more information please visit www.theruptureseries.com. NOTES: (1) Heavens to Betsy were a riot-grrrl band active from 1991 to 1994, featuring Corin Tucker, later of seminal alternative band Sleater-Kinney, and Tracey Sawyer. Heavens to Betsy contributed songs to numerous compilations, released three seven inch singles, and one album, Calculated. The album is in many ways typical of the âriot grrrl' subculture, a DIY feminist punk movement in the early 1990s, with an abrasive, lo-fi sound and a focus on empowering and intensely personal lyrics. (2) â¦at the pep rally I stole the show; wearing our purple and our whites; hey look around there's so much white; do you want to live this teenage dream; the punk white privilege sceneâ¦ -Axeman, Heavens to Betsy, 1993. (3) The theme of rupturing a possessed space is a continuation of an idea introduced by the curator Okwui Enwezor in much of his critical curatorial discussion.